We had an entire day to appreciate the Pleasure Beach today. Having completed the coasters yesterday evening this meant that there would be no time pressure whatsoever, and consequentially I spent quite a lot of the day relaxing on a park bench. It's as if a week worth of adrenalin had finally run dry on me; I simply didn't have the energy to do anything else! Rides that get you wet are not a particularly good idea in the English climate, but there's the occasional exception that just has to be ridden. 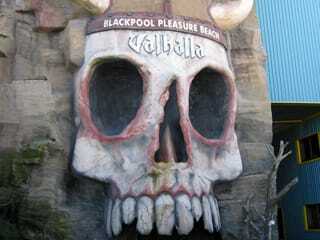 Valhalla was one such ride; an enclosed log flume with excellent special effects; fire, air, water, and, er, more water. Passengers who wish to remain dry are well advised to purchase at least one poncho, and possibly two; mine proved woefully inadequate. The layout also featured some unique surprises which I do not intend to spoil. Alice, based on Lewis Carroll's famous book, was another interesting attraction. The only thing I'm not entirely convinced of, though, is the choice of background music: the Golden Ticket theme from Charlie and the Chocolate Factory. Though there is a wonderland connection, I would have thought that one of the later themes from inside the factory might be more suitable? I also tried out the Ice Blast, essentially a much taller version of the ride that left me jelly-legged in Southport yesterday. As expected this didn't affect me anything like as badly as the first one had, which just goes to show that I'm building up a tolerance for this sort of thing!